Message from the French army chief of the Imperial Staff (CIGS) General Foch to his British counterpart William Robertson, 16 July 1917. 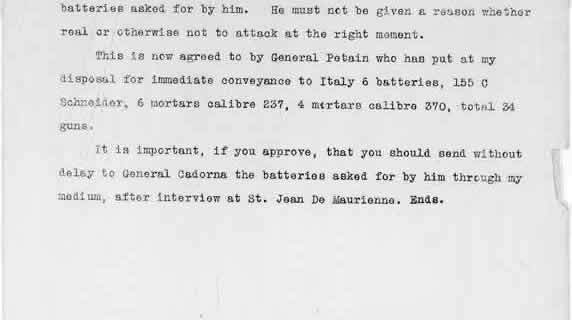 Foch's message centres on the demands of the Italian chief of staff, General Luigi Cadorna, for increased French and British munitions on the Italian Front. By July 1917, Italian troops under Cadorna had already fought 10 bloody battles with Habsburg forces on the Isonzo river. To relieve some of the pressure on the Western Front and to complement the latest Russian offensive in the East, Foch was keen for an 11th offensive on the Isonzo in early August. Cadorna warns that, without the requested Franco-British support, this attack would be delayed until the end of the month. The 11th Battle of Isonzo began on 18 August.